This easy, healthy recipe is perfect for a light breakfast, lunch or starter. It’s ready in under 30 minutes, tastes super creamy and delicious and is really satisfying too. It’s a fantastic and healthy way to enjoy the superfood. When scooping out the holes, do this bit by bit with a small spoon and only scoop out just enough to fit in the eggs. Chop the avocado in half and remove the seed. Scoop out a little bit more of the avocado holes with a small teaspoon (not too much – just enough to hold an egg. Place on a baking tray and add small strips of smoked salmon to the holes. 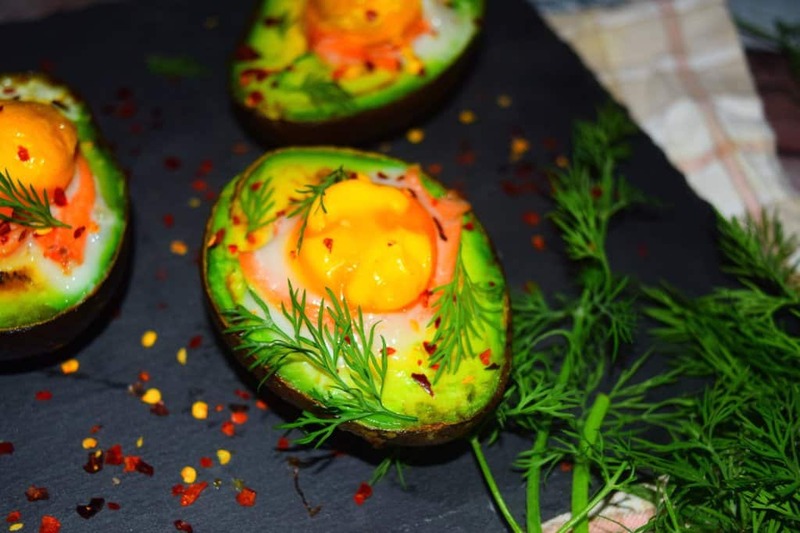 Crack the eggs into a small bowl, then spoon the yolks and however much white the avocado will hold on top of the salmon strips. Sprinkle chili flakes and fresh dill on top to serve.